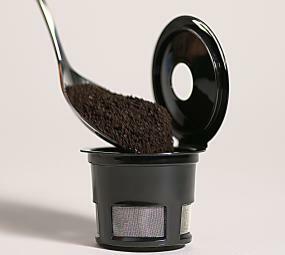 Assemble, place K-Cup pack in base, attach the water reservoir and pump; Brew and enjoy! Brews 6,-8-, or 10-ounce servings. Works with most travel and coffee mugs. Slip and heat resistant silicone grip provides easy handling. Easy to clean! Toss the K-Cup and rinse the base. The convenience of a single cup coffee maker without the high cost of big brewing machines. Compact, portable design is great for home, work, school, travel, even camping. The portable and affordable way to brew your favorite K-Cup pack of coffee, tea, and hot cocoa. 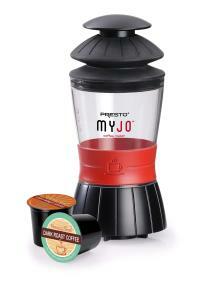 Or use the refillable MyJo cup to brew your favorite ground coffee. 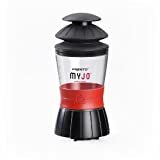 Best of all, MyJo goes where you go! It’s portable, compact design is great for home, work, school, travel, even camping. 2. It would be a mess with grounds etc in the cup etc. To the second point, the coffee in the cup was perfect with no grinds. To the first point it was quite interesting because you gently pump the water through and it took about 5 full, gentle presses to get the water through. The quiet “whoosh” at the end was exactly as described in the instructions. This review is after my first cup so I can’t comment on the long term use of the product. It really delivered a piping hot perfect cup of coffee using a keurig pod. This works well with all different kinds of pods–you just put one in the base, screw on the top and it punctures a hole in the top. The water goes through (adjusting the temperature seems to control the intensity of the flavor) and into the cup below. It is small and so completely within your own control–no electricity and you can even use hot tap water if needed. (Here in “earthquake country” where the power can suddenly go off, it’s nice to think that you could make a great cup of coffee to calm your nerves in an emergency. It’s a nice part of an emergency kit for me, along with a crank radio and flashlight.) Very convenient if you have hot water at work and want better coffee than the usual “office coffee”. This can turn out a good, strong cup (I like Peet’s or Starbucks for coffee but fyi Starbucks’ new espresso pods are too small and don’t work. Not in the plastic insert for coffee grounds that came with it–the ground is too fine–not even when you use another pod that does fit as the container. The little Starbucks espresso pods just don’t work–but all the standard sizes fit perfectly regardless of manufacturer). As for daily use, actually I -do- use it more than I thought I would, even at home. It’s so fast and clean. (Just open the base and throw away the pod). The only negative–and for some people it will be a BIG negative–is that pod drinks require forceful expelling of water through them. Since this only uses -your- effort to do this, it has a rubber cap that you need to press down on 2 or three times to create the pressurized water that’s needed. This would be easy if there was a little plunger on top to push, but there isn’t. You have to cover it with your hands and push down — HARD. I don’t really mind doing it, but it does take some physical effort and probably wouldn’t appeal to everyone for that reason. Other than that–it’s a convenient little product and does exactly as promised. Update: One very important note — the instructions for the included MyJo Cup say to put up to 2 TABLESPOONS of coffee in the cup. There is no way 2 tablespoons will fit into that cup. However, 2 rounded TEASPOONS do fit in the cup very well. And the strength of the coffee, even at the fullest water, is very nice. I bought the MyJo a couple weeks ago and tried it out and liked the coffee (I used Peet’s Gaia blend, espresso grind in the MyJo cup) a lot. The instructions say to use medium grind, but the pre-ground Peet’s coffee worked just fine, and I’m thinking the espresso grind lets more flavor through, just don’t make it too fine. The flavor was very rich at 10 ounces. But I bought the coffee maker for camping so I set it aside and went back to using my regular coffee makers. Then one day I woke up with a migraine and I needed a cup of coffee fast and I needed *not* to spend a bunch of time setting up and starting the regular coffee maker and then waiting for it to brew. 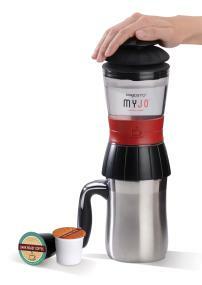 I grabbed the MyJo from the shelf, loaded up the coffee, added water from our hot-water dispenser, pushed the plunger 3 or 4 times, and in less than three minutes from start to finish, I had my 10-ounce cup of coffee. It was great! For the people who are having trouble with pushing the water through or the strength of the coffee, read the instructions — it talks about what you can do if the silicone valve gives you trouble. Also, try different types of coffee. This coffee maker does not brew like a regular coffee maker. It may take some time to find the right coffee. I was finally able to try a commercial K-cup and it worked great! One very important note: The instructions for the included MyJo Cup say to put up to 2 TABLESPOONS of coffee in the cup. There is no way 2 tablespoons will fit into that cup. However, 2 reounded TEASPOONS do fit in the cup very well. And the strength of the coffee, even at the fullest water, is very nice.